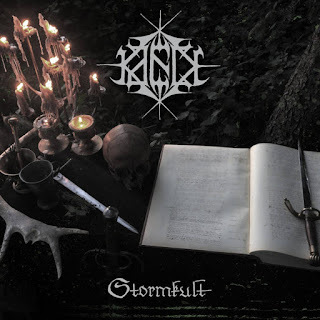 Kaeck are a band from the Netherlands that is a super group of some sorts consisting of members from Sammath, Kjeld, and Noordelingen and plays a very raw and old school form of black/war metal and this is a review of their 2015 album "Stormkult" which was released in August by Folter Records. A very fast and raw old school black/war metal sound starts off the album along with a great amount of blast beats and grim screams and the music is very heavily rooted in the 90's second wave style and also brings in the atmospheric elements of that era at times along with soem of the riffing adding in small amounts of melody. All of the songs sound like they could of easily been recorded and released 20 years ago and some of the tracks also bring in a great mixture of slow, mid paced and fast parts and a small amount of synths can be hear d at times in the background while the vocals, drums and guitars dominate most of the music and on one of the tracks the vocals almost sound melodic while still being grim at the same time and some of the tracks are very long and epic in length and one song also brings in a brief use of spoken word parts. Kaeck plays a style of black/war metal that is very old school and atmospheric and has more in common with the 90's era and stays away from any type of modern sounds, the production sounds very raw and old school while the lyrics are written in Dutch and cover darkness and war themes. In my opinion Kaeck are a very great sounding old school black/war metal band and if you are a fan of this musical genre, you should check out this album. RECOMMENDED TRACKS INCLUDE "De Kult" and "Wormvloed". 8 out of 10.